Temperatures could stay below freezing in the Lehigh Valley and northern Bucks County tonight as a storm system affects the area. Because upper air temperatures will be above 32 degrees, freezing rain will be the main concern from this storm. The question that remains is where will the surface freezing line be tonight? 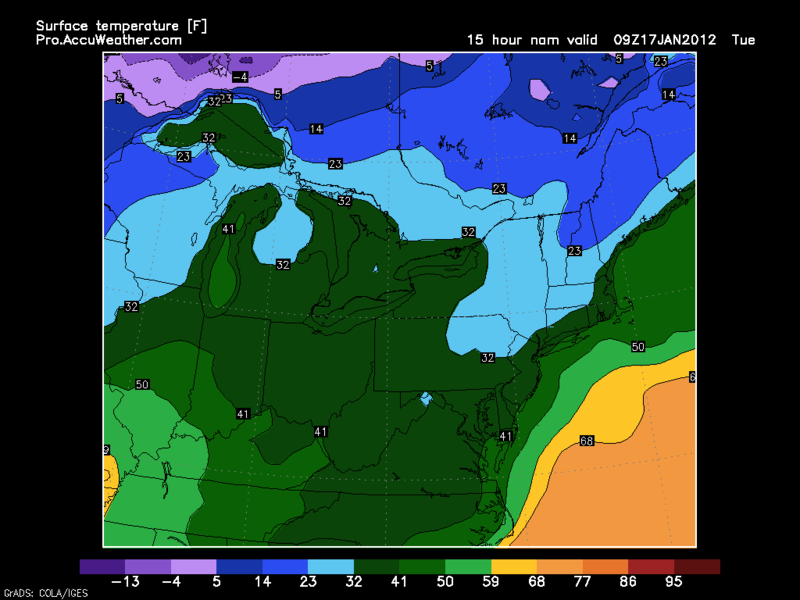 According to the GFS model, the 32 degree line may reach as far south as Quakertown. As a result, the National Weather Service has issued a Winter Weather Advisory much of New York, the Lehigh Valley, and Bucks County. Ice accumulations won’t be major, but could make for an interesting morning commute for people driving to work in the advisory area. Most of the Philadelphia region will be above freezing and could see around a 1/2 inch of rain by Wednesday night. In other news: Temperatures next week could be in the 50s. The La Niña is still hanging on, and “ol’ man winter” has yet to show his face. Not a great winter for the snow geese. Any word on the Friday/Saturday storm? At this point looking like a mix or rainstorm. I’ll take total responsibility for this storm fizzling out. I made the mistake of finally buying my three year old new snow boots for the year, and getting out the rest of our winter stuff.